May 13th, Mother’s Day weekend was my third weekend in a row to race (or pace). 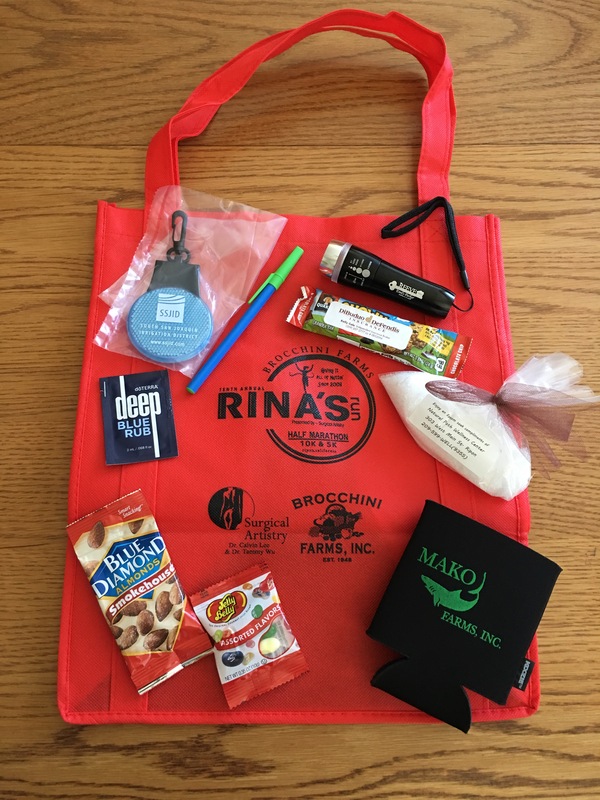 This time I was pacing the 10th Annual Rina’s Run. After a busy Friday evening at a work related event, I got home and set my alarm for 2:55 AM. Because I was waking up so early, I decided to sleep in another room so that my husband could sleep in. After getting up, taking a shower, and getting ready I finally left the house at about 3:40 AM. According to GPS, it was going to take me about an hour and 40 minutes to get to Ripon High School. I knew that would give me a few minutes to stop and get a coffee along the way. My favorite place to stop for coffee is Starbucks. Unfortunately, Starbucks was not open because it was still too early in the morning. After driving in the dark for an hour, I was in desperate need of some coffee and so I finally found a McDonald’s that was open to get coffee and some breakfast. 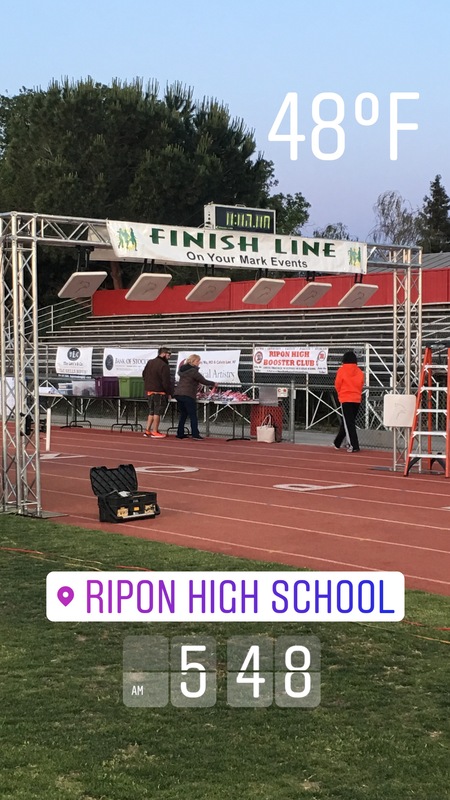 I arrived to Ripon high school at 5:30 AM to pick up my bib and to meet my fellow Pacers at 5:45 AM near the starting line. After picking up my bib and goodie bag (which check out the awesome goodie bag) I really needed to use the bathroom! I asked where the nearest restrooms were and the ladies pointed to a small building. I walked over to the building and found a man trying to open the restrooms. He was unsuccessful in opening the restrooms because he didn’t know which key (out of the million on the key ring) opened the bathroom. At this point I was getting pretty desperate to use the restroom. Fortunately, there were a line of Porta Potties across the football field and so I quickly made my way over there. 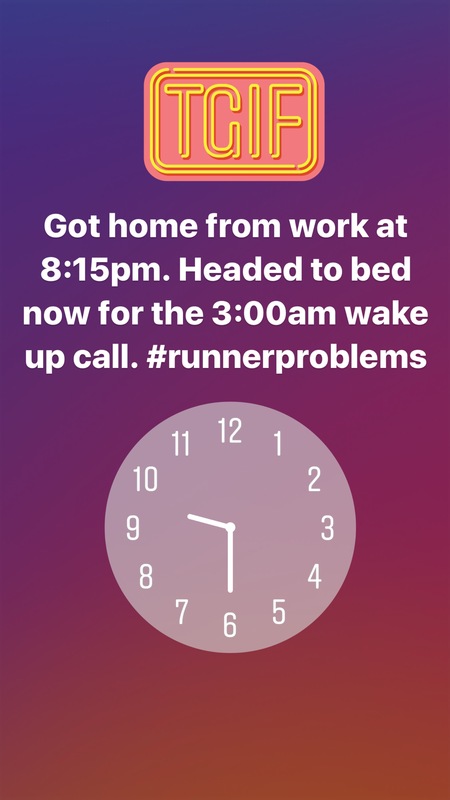 At this point it was 5:45 AM and I was supposed to meet my fellow beast pacers near the starting line. When I walked over to the starting line, there was no one there. It was cold and I needed to put away my goodie bag,, so I headed back to my car. On the way to the car I texted our pace leader to see where she was at. She said that she was about 10 minutes away so I took my time getting my things ready in my car while appreciating the warmth of my car. At 6 o’clock I headed back over towards the starting line to meet up with the pacers. 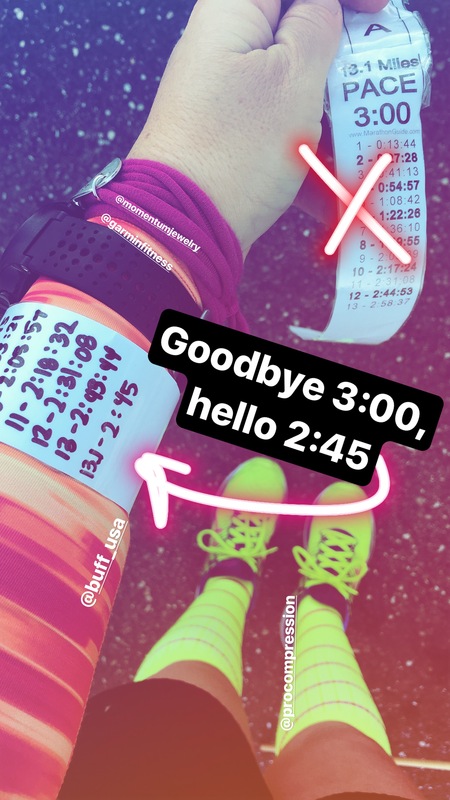 I found our pace leader and she asked if I wanted to switch to the 2:45 pacing time from the 3 hour pacing time since the 2:45 pacer wasn’t going to be there. I happily accepted the faster pace time and then found a paper to hand write out my new mile splits. I then went back to my car for a SECOND time to tape on my new mile splits. Note to self: always bring extra tape. At 6:30 am we gathered for a group picture, I made one more trip to the bathroom, and then we lined up in our corrals to start the race. Lining up in the corral and getting to meet new runners is one of my favorite parts to pacing a race. I like to try to ease their nerves because perhaps they are first-time half marathoners or I have those who are trying to go for a PR. This is also a good time to talk about my strategy and how I’m going to get us to the correct finishing time. Before I knew it, we were off and running. One of the tricks to racing is not starting out too fast. It’s very easy to do because at the start you feel great! Running slow at first may not sound difficult but it can be quite difficult. At the 1st mile marker I was already 15 seconds ahead of pace my average pace per mile of 12:35. By mile 2, that doubled to 30 seconds. I was going to try an interval strategy where I’d run one minute walk two minutes, but since I didn’t really know the how that would work for timing, I decided just to keep with running slowly. From the start to mile eight, I had two girls behind me. One of the rules as a pacer is that we are not supposed to listen to any music. We’re supposed to be there for encouragement and to give updates to those around us. Since I didn’t have anyone running next to me and talking to me, the two girls who ran behind me for 8 miles provided me some entertainment. I didn’t really mean to eavesdrop into the conversation, but it was very difficult to not listen. I finally told them that I was listening in on their conversation at about mile seven. They laughed and said it was fine. I was sad when they started walking at mile eight because that meant that I was losing my entertainment. I tried to get them to keep a running slowly with me, but neither one of them had trained for this half marathon and I could tell that they were done. I smiled, looked around me, and replied, “They’ll catch up.” Sadly, that never happened. On the bright side, however, I came in at my assigned time! Even with changing times at the last minute, I was able to stick with my pace and finish with a gun time of 2:44:38! 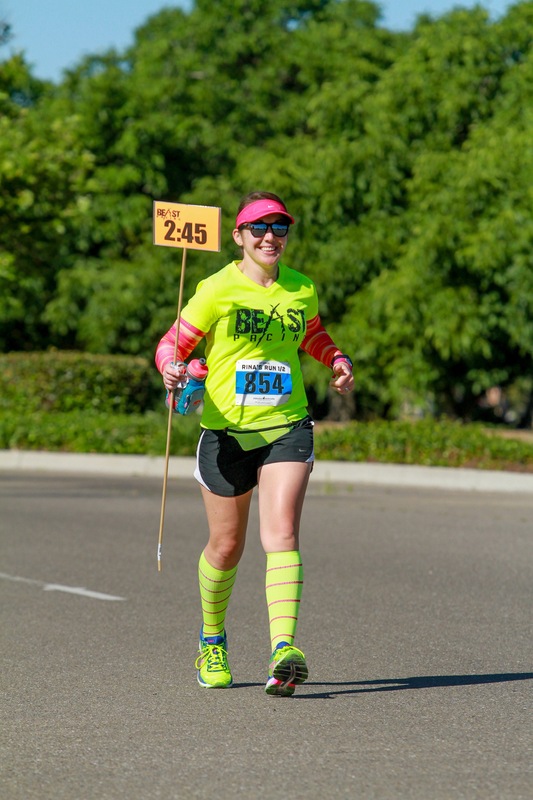 As a 2:45 pacer, it is acceptable to finish between 2:44:00 – 2:44:59. I took some finish line pictures, grabbed some post-race grub, and headed to the car. After making a quick detour to Starbucks to finally get my venti iced coffee and to change into some dry, clean clothes, I drove to church to catch the tail end of the ladies tea my mom was hosting. 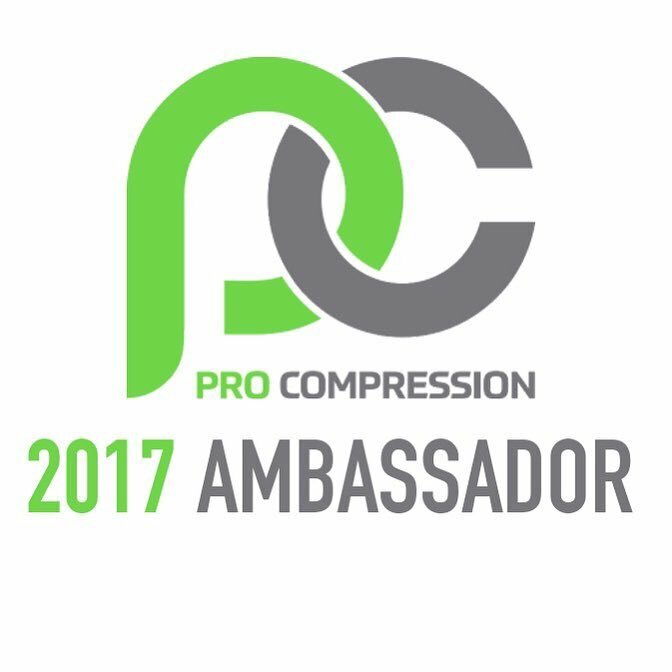 Yes, I most certainly attended the tea with my Pro Compression neon socks! Have you ever packed a change of clothes and forgotten something important? I’d love to hear about it! You are an awesome pacer! I really enjoy your stories!